A classic version of the Otis Redding track from those top US retro-rockers… This piece includes some fairly simple riff and chord ideas that will suit the beginner. The solos include some tricky bends and fast pentatonic-style licks that may take some practice. Formed in Atlanta Georgia in 1984, by brothers Chris Robinson (vocals) and Rich Robinson (guitar), The Black Crowes started out as the Greasy Little Toes. Their musical influences were firmly rooted in the traditional blues/rock of such bands as Aerosmith, Free, The Faces, The Stones and Lynyrd Skynyrd. The band members also included Johnny Colt (bass), Steve Gorman (drums) and Jeff Cease (Guitar). In 1989 they signed to Def American records, and released their debut album Shake Your Money Maker in 1990. The music was simple and traditional, with the album including such tracks as “Twice As Hard”, and a storming version of the Otis Redding classic Hard To Handle. Other albums released by the band include The Southern Harmony And Musical Companion and Amorica. Exercise 2 features the verse riff for the right channel guitar. The part is based around the chords of B major, E5/B, F#5 and B5. The B major chord is performed with rhythmic mutes. Be sure to keep the rhythm tight and punchy. 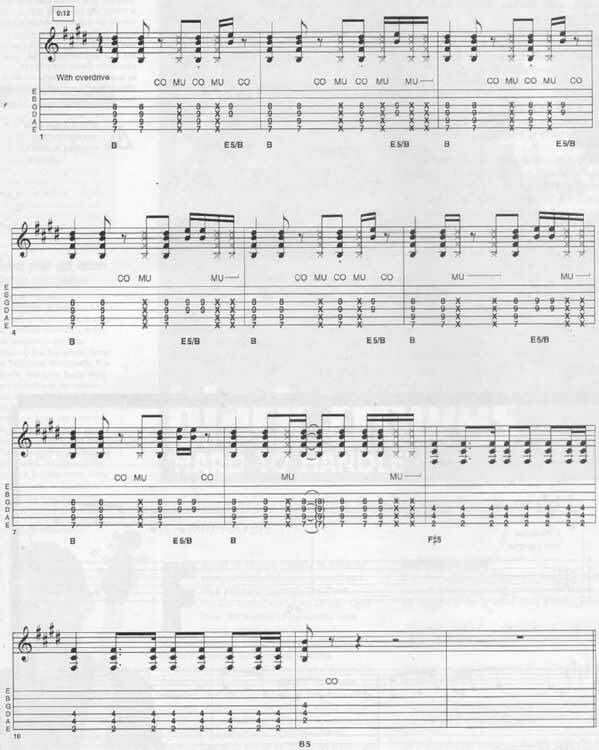 Exercise 3 shows the verse riff performed by the left-channel guitar. This part includes a fairly straightforward blues riff, using the chords of B5 and B6. The chords of B minor and Bsus2 are included by adding the D and C# notes on the D string respectively. This part also includes the F#5 chord. Exercise 4 is the bridge part played by the right-channel guitar. This part includes the higher-register chords of D major, E major, A major and B/D#, performed on the top four strings. Look out for the slides performed between the changes. Exercise 5 is the bridge part for the left-channel guitar. This part is pretty easy and includes the chords of D5, E5, A major and B major. Exercise 6 is the left-channel chorus part and uses the chords of A major, E5, and B5, with more rhythmic mutes between the changes. Exercise 7 is the right-channel chorus part and includes the higher-register chords of A major, E major and B/D#. Take care with the rhythmic mutes and slides. The solo is full of classic blues/rock style licks plus some interesting major/minor pentatonic licks and some great string bending ideas. Exercise 9 is the second guitar solo and employs much the same scales as the previous example. This solo includes wrenching unison bends and more blues/rock-style Dorian and pentatonic licks. Enjoy! It’s just a part of Black Crowes Hard to Handle tab and sheet. © 2012 - 2019 TabsClub Powered by TabsClub 42 queries in 0.336 seconds.